I think its safe to say that our first meeting at the Brown Cow last week was a roaring success! Considering the fact that two weeks ago, this whole project basically consisted of Gina, me, and our idea, it was really amazing to have 20, former total strangers but soon to be gardening friends, people show up just because they saw our flyer or read our announcement on the FP Forum website. You guys brought a lot of enthusiasm and great ideas! What is a community garden and why are they awesome? A piece of underused or vacant land transformed into a flower, herb, and/or vegetable garden shared by the community. Community gardens allow residents to produce their own nutritious food while also acting as a catalyst for neighborhood and community development. Community gardens provide gardening space for residents who may not have space at their home. 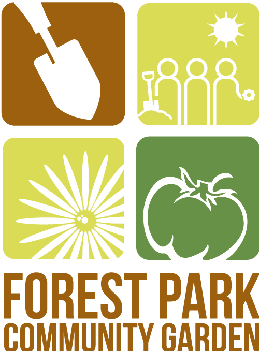 Did you know: Forest Park had a vibrant and successful community garden in the mid to late 1970's. At its hight, the garden consisted of 260 individual garden plots. The garden was dismantled so that the property could be used for industrial development. Potential garden elements: small plots ranging in size from 4x4 to 20x20 or even bigger tended by individuals who grow what they choose and harvest what they grow; a larger community plot that is planned and tended by garden volunteers and the produce of which is either sold at farmers markets or to area restaurants or donated to those in need; a children's garden area including small children's garden plots and play equipment; garden tools and a tool shed type structure to store them in; a composting area; a shady space with tables or benches for socializing or holding garden meetings; and a water source for watering crops. How much will this cost? A very preliminary estimate is that the garden could be up and running with as little as $3,000 - $5,000. Start-up costs will depend on soil conditions (if the soil is very poor or contains toxic medals we may need to build raised beds and fill them with clean soil / compost), whether or not there is already water service at the site, and whether or not there is an existing fence at the site. Once the garden is up and running, ongoing expenses will include: leasing costs ($1 a year is typical, but not a guarantee, for community garden projects); monthly water meter costs, and other various site maintenance materials. Where will we get the $$? For start up costs, donations of money and materials will be solicited from area residents and businesses. Also,we will look for mini-grant sources from nonprofit or government sources. There is a small chance that the Village may be able to give us some $$ from their Parks and Recreations budget, although there is no guarantee this will be possible. Once the garden is in operation, income will be generated from rental fees of the individual garden plots which could average around $30 a year. Additionally, if produce from the community plot is sold, that would also create revenue for the garden.